In what looks to be the biggest surprise reveal in years, Engadget has received a bounty of leaked information and images of HP's upcoming WebOS tablets in advance of the company's big upcoming February 9th announcement. Code-named "Topaz" and "Opal", two WebOS-powered tablets will reportedly be available globally in both 9" and 7" screen sizes respectively. A screen shot of an internal marketing plan reveals a solid and varied lineup of WebOS tablets, arriving in wi-fi, 3G and LTE 4G variants for both Verizon and AT&T. Somewhat tragically, however, the given retail availability of these tablets is not expected until September of this year, placing them well behind Apple's iPad followup, RIM's Playbook and the flood of Honeycomb-powered Android 3.0 tablets expected over the course of the year. 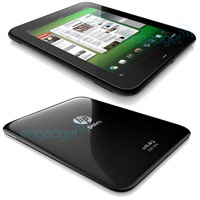 From a hardware standpoint, the renderings look similar to the bevy of black slab-like tablets currently on the market, albeit with a very high-gloss finish adorning the backside of the device, giving the tablets an aesthetic touch far more reminiscent of HP's PC line than Palm's traditional use of soft-touch rubberized coatings. A front-facing camera does appear to be present and no physical buttons adorn the exterior of the device aside from what may possibly be a volume rocker on the top corner. The traditional gesture area resides below the screen, as does the pseudo-button first seen on the Palm Pre Plus last year. From the screen image shown in the render, WebOS also looks surprisingly unmodified in its transition from smartphone to tablet. Finally, the "Palm" branding is still thankfully present on the leaked images, though this very well could change come production time. Engadget has updated their original piece to say that both devices will be powered by an unspecified 1.2Ghz processor, with no word on storage capacity or whether or not the CPU is a single or a dual-core. The wi-fi version is specifically mentioned as targeting US retailers such as Best Buy and Amazon. Curiously, there is no mention at all of any Sprint version, which partially debunks the earlier rumors of a big Sprint WiMax tablet launch to coincide with the 2 year anniversary of the original Pre, though Sprint could still receive an upcoming WebOS smartphone. September 2011 and July 2012??? RE: September 2011 and July 2012??? From the looks of these renderings, they're looking to out-apple apple. They might sell if they can undercut apple on price. One will be to me. You'll flock to it to by year's end, banker boy, late as usual. I'm looking forward to the 1' tablet. Just hoping the virtual keyboard is usable. RE: I'm looking forward to the 1' tablet. Was supposed to be 1 inch. Is this site substituting characters? The Engadget site says, "9-inch Topaz and a 7-inch model codnamed Opal". Yes, 7" instead of 1"
Someone posted on Twitter that it was a miss-print & that they are expected first-quarter. and somebody on twitter never lies. Ok - if they come out 1st quarter against the iPad 2, who in their right mind would buy these? Unless they have some sort of killer app, they're doa. 7" tablet THIS quarter, likely April or May. Stand back. It's MINE!! !